RainCloud is gearing up for a party!! 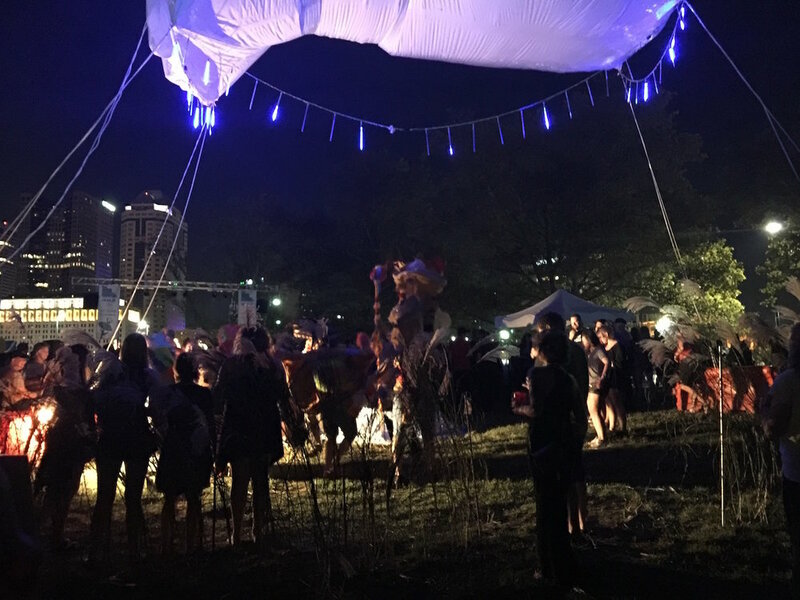 Come see RainCloud for yourself this weekend, September 16-17, at the final Independent's Day Festival (IDX) in downtown Columbus. Check out the map of all the fun activities below and where RainCloud is located (aka the Cloud Feature). 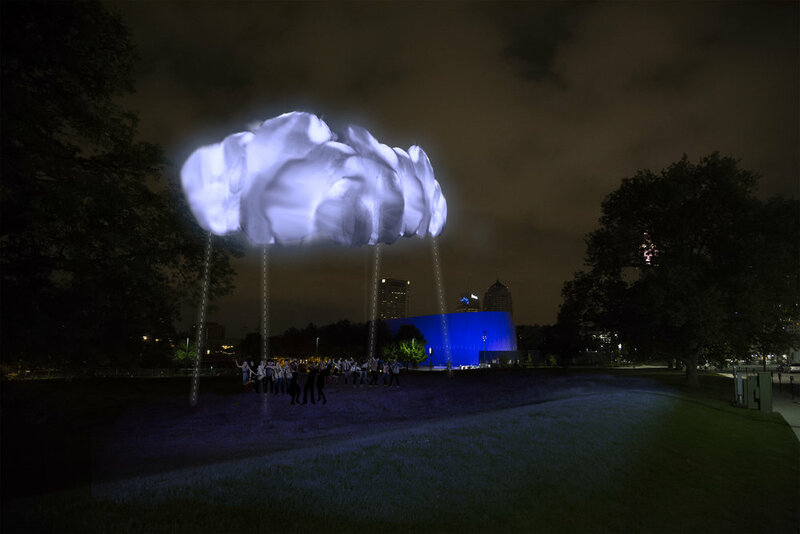 RainCloud is a floating augmented high-tech installation as well as a symbol of the natural environment; a reminder of the simple beauty found in our atmosphere and the never-ending cycle of water between ground and sky. On Saturday September 16 at 1pm there will be OHIO H20: Ohio Freshwater on a Global Scale panel discussion. We will be talking about the state of water locally, nationally, and globally. We will focus specifically in the areas of environmental protection, economics and industry, health and well being, and the future outlook of water. At 8pm Puppets from Pilgrim Heidi of OpenHeartCreatures will perform Empathy Eyeball followed by Thunderstorm, an interactive multimedia light performance by OBLSK. Pelham Johnson - is a filmmaker, inventor, researcher, and artist. He uses a combination of creativity, technical know-how, and a love for working collaboratively to create finely crafted moving art and media that tells a story with a purpose. 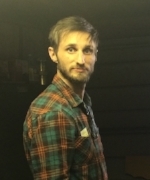 Aidan Seine - Aidan resides in L.A., California and made the journey to the midwest to help build the creation that is, RainCloud. He's well versed in interactive electronics that helps bring RainCloud to life. Maxwell McEvoy - is a local sculptural and installation artist who has helped make the RainCloud become, what else, but an actual raincloud, though made out of polyfilm instead of nature. Marque Reavley - is an application engineer and web developer who helped create the code that allows RainCloud to be interactive with participants that enter under the cloud creating the elements of a rainstorm like lighting and thunder. Come have fun with the whole family this weekend and celebrate the independent culture, commerce, and creativty of the community that is Columbus, Ohio! Wondering what's been going on with the RainCloud Project? Well, look no further! We've got some updates for you! Our team of artists, programmers, and performers have been busy at work creating prototypes to make the RainCloud come to life. They are testing different types of fabrics and helium balloons to create a cloud light structure. There will also be several LED lights emulating rain as people gather below the RainCloud. Along with the installation there will be a performance by Pilgrim Heidi of Open Heart Creatures and an environmental panel discussion to showcase the impact Ohio has on fresh water in todays world. This large scale sculpture that will be outside located by the Scioto River during the Independent's Day Festival Sept. 16 & 17th in Franklinton and will be fun for the whole family! The silo projection at Land-Grant Brewery for the 2nd Anniversary Party last weekend on Saturday was a success! We were there projecting and documenting what people had to say about the 'giant beer can in the sky'. Land-Grant Brewery in Franklinton is having their 2-year anniversary party tomorrow from noon-midnight and OBLSK will be projecting onto the silo next to the building! The anniversary party will feature some limited-edition Land-Grant beers -- 9 of which are making their debut this weekend -- and some standbys like Stiff-Arm IPA. Land-Grant is taking over the parking lot next door for the party and there will be tons of special beers, live music, food trucks, and the Ohio State vs. Penn State game screening at 8pm. What's your favorite Land-Grant beer? What do these beers make you think of when you take a sip? Let us know what you thought of the projection on our Facebook page. CreativeMornings were started in 2008 in New York City by Tina Roth Eisenberg to serve as open, accessible monthly breakfast gatherings for the city's creative community, featuring short, themed talks by local creatives. 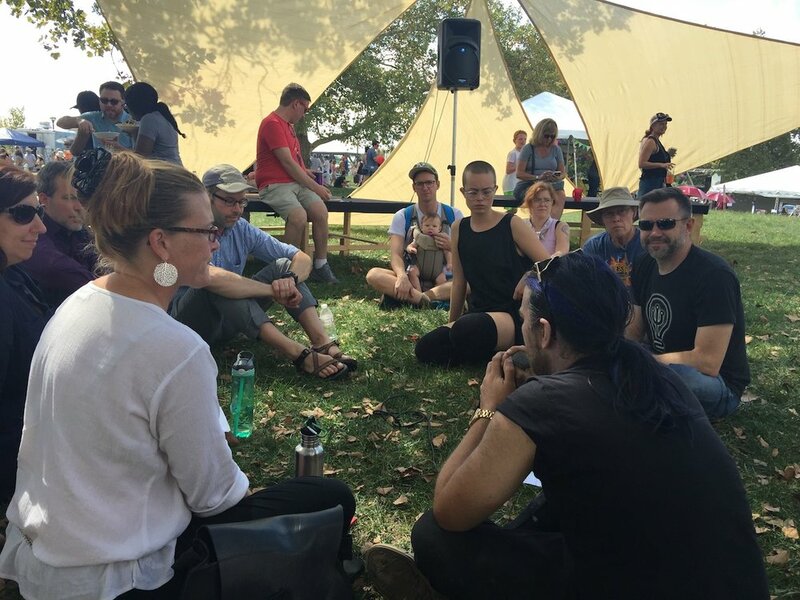 They have since expanded to chapters in 156 cities, which participate in monthly global themes which connect all the participating cities. OBLSK's Eve Warnock will speak about this month's theme, 'Transparency', at the Columbus CreativeMornings event this Friday, October 21 at Continental Office from 8:30am-10:00am. Registration is free and there are still spots available! The Transparency of it All…. It was like looking through a transparency. A layer that existed unnoticed, manipulating just enough to alter but never enough to bring attention. Her eyes tried to focus and refocus until she allowed herself to sink into the screen as the imagery washed over her and the reality of the story convinced her thoughts it was true. How many transparent filters are out there? Each individual looks through their own custom transparency via the lens in their eyes; The transparent structure that helps to focus light. As we broaden our perspectives we see that we are surrounded by “lenses” proving and documenting reality. But we must question the authenticity, the true nature of the origin, because it can get skewed, and sometimes lost, through the many transparencies it passes. Please join eve Warnock in a discussion on the idea of transparency by analyzing the transparency of perspective, of emotion, of information, and of light. A projection installation will be presented by OBLSK.